The gaming world will welcome the Sony PS4 and the Microsoft Xbox One this year. So lets compare how they both fare in terms of features and specifications. As usual, price is an important area and Microsoft and Sony have announced different prices for their rival consoles. The PS4 is the cheaper at £349 and the Xbox One costs £80 more at £429. It’s worth pointing out that the Xbox One price includes the new Kinect sensor but the PS4 price does not include the PlayStation Camera. Add the price on and the PS4 adds up to £393. AMD is the chip maker of choice for the PS4 and Xbox One. Each uses a SoC (System on a chip) which combines the CPU and GPU. The processor is an x86 64-bit chip with 8 ‘Jaguar’ cores and an estimated clock speed of 1.6GHz. On the surface, it appears as if the PS4 and Xbox One have the same AMD Radeon GPU. However, the PS4’s is more powerful with 1152 cores compared to the Xbox One’s 768 – 50 percent more, according to Anandtech. It also has a higher peak shader throughput of 1.84 TFLOPS against 1.23 TFLOPS of the Xbox One – although this is less important. Whether these differences will be noticeable when then console is hooked up to your TV in your lounge is another question, but on paper the PS4 is the more impressive. Both systems have 8GB of RAM inside but Sony wins marginally in this area using faster GDDR5 memory compared to GDDR3 offered by the Xbox One. Luckily for the Xbox One, it has 32MB of eSRAM embedded memory expected to be used by developers as a cache. Microsoft says the combination of the CPU, GPU and eSRAM is like ‘having a supercomputer in your living room’. It’s a tie when it comes to storage because both have a 500GB hard drive. The amount available to the user will be less because some of the space will be used for the system software. It’s another tie when it comes to the optical drive since both Xbox One and PS4 have a Blu-ray/DVD drive as standard. Things are once again pretty similar when it comes to connectivity with the PS4 and Xbox One offering Wi-Fi, Ethernet, optical out and USB 3.0. If it bothers you, the PS4 has Bluetooth 2.1 which the Xbox One does not. The Xbox controller remains largely the same as previous generations. It has a number of changes but they are subtle such as the redesigned D-pad and thumb stick. The main new feature is the new Impulse Triggers for better feedback. 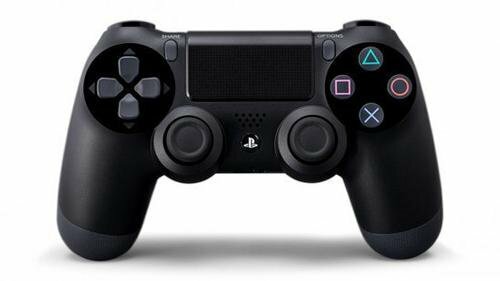 The PS4 DualShock 4 controller is quite different to the PS3’s. It has a trackpad in the middle and integrated ‘Move’ motion control. There are plenty of features which these consoles offer; they are more all-round entertainment devices now than just devices for playing games. We’re going to stick to pointing out two of the key differences about which you need to know. ‘Always online’ has been a major subject around the PS4 and Xbox One leading up to the launches and it’s the Xbox One that requires an internet connection for you to be able to play – although it needs only to validate every 24 hours which isn’t half as bad as requiring a constant connection. Update: After much pressure from the public and the media, Microsoft has done a U-turn on this saying that the Xbox One will no longer. A second issue is being able to use second hand (pre-owned) games. Again the PS4 is the console with no restriction (see video below). However, it’s a different story for Microsoft’s console. Xbox One users can lend games to friends who they have had on their Xbox Live list for at least 30 days but you can only lend them once. Update: Microsoft has also changed it’s mind on this element, saying that there will be no restrictions. “Trade-in, lend, resell, gift, and rent disc based games just like you do today – There will be no limitations to using and sharing games, it will work just as it does today on Xbox 360.” added Mattrick. 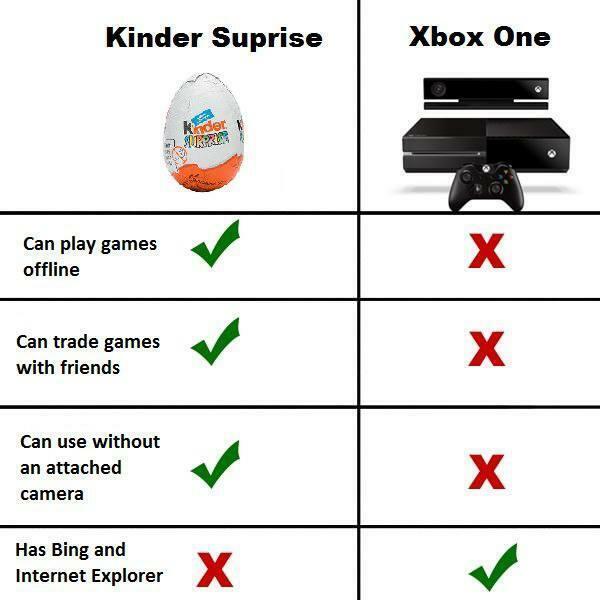 So, just for a bit of fun let’s compare xbox one and kinder joy and make it simple for people to understand the features.